The developer behind controversial plans to build 771 new homes off Anchor & Hope Lane is to hold two short consultation sessions this weekend to explain their proposals to residents. Neighbours in Atlas and Derrick Gardens had complained that the development – likely to be the first development on the Charlton Riverside to get planning approval, albeit from Khan rather than the council – would loom over their homes, while Greenwich’s planning chair Sarah Merrill called it “reminiscent of Stalingrad”. Rockwell is now holding a last-minute public exhibition about the proposals – however, it will only run from 9am to 11am on Saturday 12 and Sunday 13 January, at the Anchor & Hope pub. The City Hall consultation on the scheme has been extended until the following Monday to take account of the brief opportunity for neighbours to talk to Rockwell about the proposals. See more on the revised plans here. Controversial plans to build 771 homes at the end of Anchor & Hope Lane were rejected by Greenwich councillors last night after Squeeze singer Glenn Tilbrook joined neighbours objecting to the scheme. Developer Rockwell had planned to build on the VIP industrial estate behind Atlas and Derrick Gardens, with five 10-storey blocks – with its website, seemingly assuming it would get the go-ahead, already branding it “the next riverside hotspot”. But councillors agreed with neighbours who said Rockwell’s scheme went against the recently-adopted Charlton Riverside masterplan, which sets out a vision for lower-rise developments aimed at families in Charlton to sit in between the towers of Greenwich Peninsula and Woolwich. All 11 councillors on Greenwich’s planning board voted to reject the scheme, to applause from the public. Squeeze frontman Tilbrook – who lives in Charlton – told councillors that he had tried to engage with Rockwell because he owns a studio adjacent to the development site, which is used as a base for the band’s tours. He said he feared losing access to the studios. Tilbrook added that he feared that noise from the construction work would make the studio unusable, then new residents would complain about noise coming from the studio. A representative from the industrial wharves on the peninsula said that new residents at the Royal Wharf development in Silvertown, across the Thames from the proposed Rockwell scheme, had already started complaining about noise from ships loading and unloading goods. One resident, Joyce Sloman, said the area – “becoming the biggest shopping centre in south-east London” would be unable to cope with the traffic. While Woolwich Riverside councillor John Fahy told the committee the council had to act “in the best interests of the community – not hedge funds in Guernsey” – a reference to the development firm backing the scheme, Leopard Guernsey Anchor Propco. He said the council would “compromise itself” if it backed the scheme. Rockwell representatives said the scheme offered a “fantastic opportunity to kick-start the regeneration of this area”, saying it “has the makings of a destination, a real place in its own right”. It claimed it would generate over 200 jobs. But the firm – which has retained former Greenwich Council leader Chris Roberts’ company Cratus Communications as lobbyists – arguably overreached itself by drafting in a teacher who wanted to set up a nursery school on the site, claiming she could not find another suitable site. Because of the length of the meeting – which also considered a major development in Abbey Wood and controversial plans to revoke the hazardous substances permission on the East Greenwich gasholder (both refused) – speakers were severely limited in time by chair Sarah Merrill, which angered residents, many of whom are still smarting from the way they were treated at the Fairview Victoria Way planning hearing in January. But they had little to fear as councillors lined up to put the boot into the scheme – despite council officers having recommended they back it. Local MP Matt Pennycook said on Thursday morning that the decision was “a clear signal to developers that the community will not accept proposals that do not honour the vision set out in the 2017 Charlton Riverside masterplan”. Monday’s meeting also saw refuse to withdraw permission to store hazardous substances at the Greenwich gasholder site, and a 17-storey tower block at Abbey Wood turned down. The full planning discussion was captured by The Charlton Champion‘s sister website 853– the session starts two hours and five minutes in. Sound is weak in some points. You can also read tweets from the meeting. See past stories about the Rockwell scheme. Controversial plans to build 10-storey blocks behind homes off Anchor & Hope Lane go to Greenwich Council’s main planning committee on Monday. Developer Rockwell plans to build 771 homes on land surrounding Atlas and Derrick Gardens – which, if approved, would be the first housing development in the Charlton Riverside regeneration scheme. Council planning officers are backing the scheme – but residents of Atlas and Derrick Gardens say the plans ignore a recently-finished masterplan that cost £850,000 and took five years to prepare. A petition has been set up to demand the council sticks to its plan. Derrick and Atlas Gardens Residents’ Association chair SELINA TALLETT says the people most affected by the scheme feel patronised and ignored – and Greenwich councillors need to defend their council’s own masterplan. At the river end of Anchor and Hope Lane, you’ll find Atlas and Derrick Gardens. It’s a community of 74 homes, a few houses with the rest being small flats. Our community is a blend of social and private tenants as well as homeowners. I’m a resident of Derrick Gardens – I have only ever lived in the borough of Greenwich. These homes are examples of model worker home properties and carry some historical significance, having been built by local shipping industrialist William H Cory for his employees and their families in 1908. Earlier this year, our homes were given conservation area status to reflect this history. However, our community is now fighting for its survival. As the only homes on the Charlton Riverside, we have peacefully lived for years with all industry around us – including what is now the VIP Trading Estate, which is behind Atlas and Derrick Gardens. But now the Mayor’s development plan identifies Charlton Riverside as an “opportunity area” for London. To capitalise on this, Rockwell Property – on behalf of Leopard Guernsey Anchor Propco – has bought the VIP Trading Estate and wants to build luxury “family homes” on the site. These ‘”family homes” would feature a collection of tower blocks, with most of the 771 properties exceeding £500,000. After nearly two years of discussions, the “affordable” housing provision has climbed from the initial offer of 8% to 25%, whilst the density has reduced from 975 to 771 homes. Rockwell’s proposed blocks of flats, with up to 10 storeys, would be just 18-20 metres behind our homes. We would completely lose all and any natural light. Yet Greenwich Council’s planning officers deem this an “acceptable” trade-off to “kick-start development in the area”. London needs new homes, but I and other Atlas and Derrick Gardens residents feel our quality of life should not be forfeited for financial gain and to meet local authority targets. Especially where there is established planning guidance in place which says that homes built within this area should be of low height and low density, and complementary to the heritage of the area while not having a negatively impact on existing neighbourhoods. 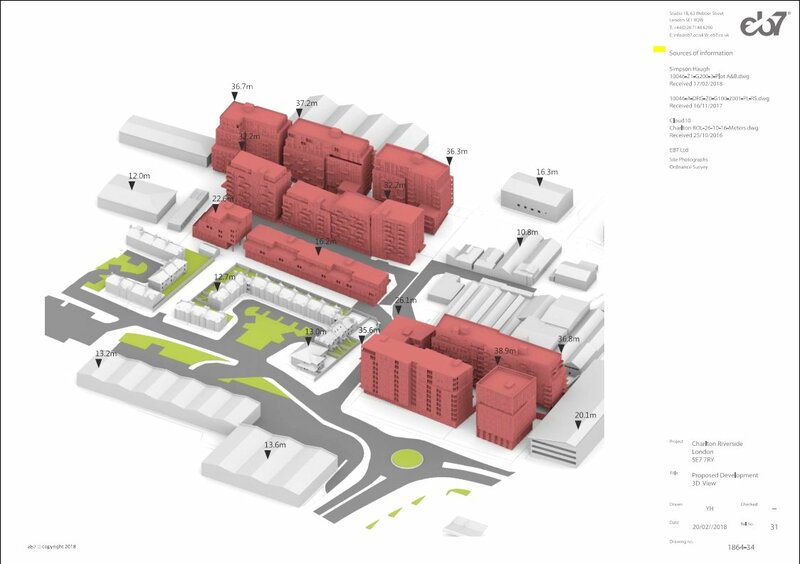 Rockwell’s development has been designed without meeting key parts of local strategy, policy and the masterplan established specifically for the Charlton Riverside. For me, it’s beyond disappointing that Greenwich Council’s hard work in establishing this local guidance is being ridden roughshod over by a need to meet targets and a desire not to upset developers. The housing crisis has been a very easy loophole for developers to exploit: how many Londoners can afford luxury one/two-bedroom flats exceeding £500,000? Rockwell’s plans are disingenuous at best, mercenary and opportunistic at worst. We need new homes which meet all layers of planning policy, not just the bits which are convenient or release the most profit for developers, regardless of the consequences for others. Which is why Greenwich Council needs to hold the line. But nothing in this process has convinced us that housing Greenwich borough’s residents, especially the 17,000 on the waiting list, is actually a priority for either the developers or for the council. Greenwich planning officers are scared of what will happen if Rockwell’s application is rejected: paying for an appeal and a date with the Planning Inspectorate. But Greenwich Council should not fear an appeal. Rockwell knew the local policies in place when it purchased the land. It has already spent five years and £850,000 of existing residents’ money in developing a masterplan – not upholding this and not explaining in detail why planning officers are supporting Rockwell’s schemes calls for questions to be asked about whether public funds are being mismanaged. We support the petition urging councillors to stick to their masterplan. We have been disappointed with the lack of honest engagement from the council – including some of the very councillors we elected – with an apparent inability to see the wider issues that approving this application will create and exacerbate. Even though this proposal has loomed over us for two years, we only had a site visit a month ago, where it was clear that some who participated and would be deciding on the application did not even know our neighbourhood existed. Charlton Riverside is already an identified opportunity area – development does not need to be kickstarted by inappropriate schemes by hook or by crook. It needs to have the right start to set the tone for the rest of the area. Many communities across London will be going through similar issues with development which is both inappropriate for their local community and does little to address the actual housing crisis. Our planning system needs to change and we need to see Greenwich at the forefront, listening to and engaging with us, using the policies developed with taxpayers’ support to benefit its residents, not for the financial benefit of developers – especially when those developers are aided by consultation organisations employing former council leaders. We hope that by raising awareness of our plight, we can urge both officers and councillors to reject this application, and demand better for our Charlton Riverside. The residents’ petition on the Charlton Riverside Masterplan can be found at change.org. Plans to redevelop the VIP Trading Estate by developer Rockwell are to go before Greenwich Council’s Planning Board on Monday 9th July, the original hearing in April being deferred until after the local elections held in May. The plans have caused controversy over the height and density of the proposed housing, plus the level of affordable and social housing to be included in the scheme – the latest plans are for 25% of the housing to be ‘affordable’, of which 71% will be social housing. A petition raised by local residents asking Greenwich Council to enforce the terms of its own Charlton Riverside Masterplan – citing the £850,000 cost of developing the plan – had over 400 signatories at the time of writing. From The Murky Depths has taken a look at the outline plans for the £4.9 million of Section 106 payments – money paid to the council which is meant to be spent in the local area – due to come from the development. Also due to be heard at the same planning board meeting is a request for Revocation of Hazardous Substances Consent for East Greenwich gasholder, one of the steps necessary to allow demolition of the historic structure. Labour councillors recently voted down a motion opposing demolition of the gasholder. Also on the Greenwich Peninsula, councillors will also discuss plans for a temporary 4,400-capacity concert and conference venue to be built at the north end of Tunnel Avenue.